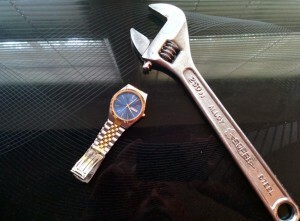 I opened this watch with this wrench! I never knew one could open the back of a watch with a big old crescent wrench until, out of necessity, I tried it. It made me wonder how many other discoveries I miss because I avoid the point of need. The saying is true that necessity is the mother of invention. The point of need, combined with an ear and heart attentive to the voice of imagination, ingenuity, and inspiration, is the place where unimagined possibilities appear. Or use FeedBurner for more options.